The Turbocat® Zoom is engineered with exclusive Z-Tech design and features a sleek new profile and brilliant colors. There’s never been a quieter, more powerful turbine powerhead. Remove embedded dirt and dust more effectively while easily maneuvering the lightweight Turbocat Zoom. And it requires no separate powercords, batteries or additional electricity. 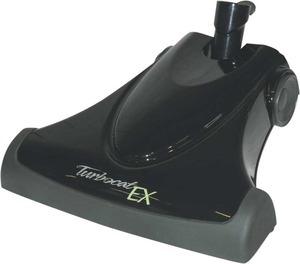 The Turbocat Zoom is a powerful air-driven powerhead that operates without electricity, power cords or batteries. This powerhead harnesses the airflow of the central vacuum system to generate maximum airflow and deep cleaning power. Installation and operation are easier and less costly. DeepSweep II Brush Roller relies on a proven design of tufted bristles to ensure deep cleaning contact. Ribs and traps, located at both ends of the roller and one side of the belt, block debris and allow for quick and easy cleaning of the roller. Multi-port Base Plate is surrounded by recessed channels to increase airflow and enhance vacuum performance. Run-Silent Bearing Isolators encase the turbine bearings for quiet performance. The Isolators hold the turbine firmly in place while reducing vibration. Soft Pro-Tech Bumper protects woodwork and furniture from “bumps” during vacuuming. Easy-Glide Front Wheels provide easy maneuverability and responsiveness. Large Air Intake Port facilitates dirt entry and provides improved cleaning performance. Self-tensioning, non-slip, Silent Drive Belt reduces vibration, noise and maintenance. Owen Perkins of Just Central Vacuums, Inc. shares the most common service issues with Turbocat air-driven power brushes, plus how to troubleshoot and repair. Short video of the T210 on the 35ft Vacoflo hose and my dual motor Riccar central vac. Does pretty well, and the Riccar really makes it go. Not sure I'd say it does as well as a electric P/N but it's pretty close.